Reports in the media and from well-informed sources have indicated to Of Fosse and Foxes that Leicester City's hunt for a new manager may be drawing to a close, with a surprise swoop for a former Newcastle United duo in the offing. Lee Clark - who earlier in the week distanced himself from rumours that he had been approached by the Foxes - is expected to take over as the day-to-day manager of the club, his impressive forty game unbeaten run at League One Huddersfield Town proving enough to impress the Foxes' Thai owners. To accompany Clark as a young manager, Vichai and Aiyawatt Raksriaksorn are anticipated to offer a new role as Director of Football to former Newcastle, Manchester City, Fulham and England manager Kevin Keegan. 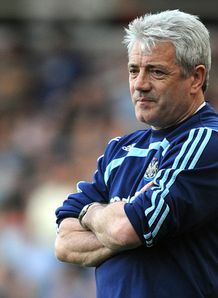 The speculation over the duo - who worked together at Newcastle United during Keegan's second stint in charge of the Magpies - has grown today after news over an approach by the Raksriaksorns to Keegan was rumoured in the Saturday newspapers. Following Hull City's 1-0 victory at Nottingham Forest this afternoon, former Foxes manager Nigel Pearson distanced himself from reports that it could be him stepping back into the hot seat at the King Power Stadium.